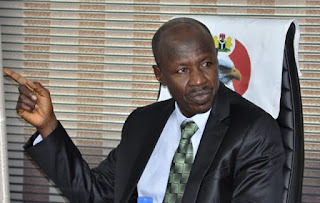 Ibrahim Magu, acting chairman of the Economic and Financial Crimes Commission (EFCC), on Monday failed to answer a question on corruption allegations against Abdullahi Ganduje, governor of Kano state. In different videos widely circulated online, Ganduje was allegedly captured collecting kickbacks from contractors. At a press briefing in Abuja on Monday, Magu refused to respond to a question on the video. A journalist had asked the anti-graft czar to speak on the issue but he responded, “Next question please”. Critics of the current administration have accused anti-corruption agencies of refusing to act on the videos because Ganduje is a member of the ruling All Progressives Congress (APC). The governor has distanced himself from the video, accusing Jafar Jafar, publisher of Daily Nigerian, the online publication which leaked the video, of blackmail. At the press conference, Magu reeled out the successes of the commission since he was appointed in 2015. He also said the agency is seeking to extradite Diezani Alison-Madueke, former minister of petroleum resources, because the UK authorities failed to take legal action against her. “It has taken so long and it is very unreasonable that she is not being tried there,” he said.